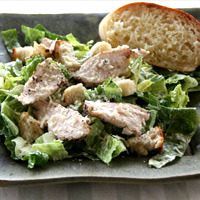 I love a good Caesar Salad. This one is my favorite! Fill a small pot 2 or so inches with water. Bring to a boil, then reduce to a simmer. 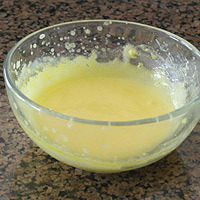 In a glass or stainless steel bowl add egg yolks, lemon juice and water. Whisk well. Place bowl on top of pot of simmering water. Make sure the water doesn't touch the bowl. 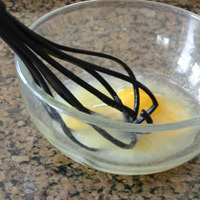 Whisk constantly until the mixture reaches 160 degrees. Remove from heat. Not only is 160 degrees the temperature at which the eggs emulsify, it is also the point at which they are safe to eat. Between 160-170 degrees is the point where the eggs start to stick to the sides and solidify like scrambled eggs. Remove the bowl immediately if this starts to happen and whisk constantly. 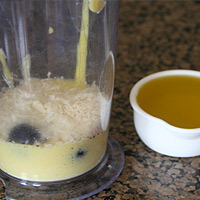 Transfer to a food processor or cup of an immersion blender. Add anchovy or olives, salt, sugar, garlic and parmesan. Blend well. With the mixer running add the olive oil in a slow steady stream. Process until slighlty emulisfied. Stir in black pepper. Tranfer to an airtight container until ready to use. Good in the refrigerator up to one week. 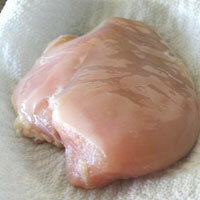 Rinse and pat dry the chicken breasts. In a plastic bag mix the olive oil, salt, and freshly ground pepper. Add the chicken and coat it completely in the mixture. Set aside at least 15 minutes at room temperature or up to eight hours in the refrigerator. 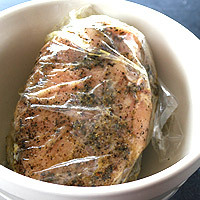 It is important to dry the chicken so the olive oil can penetrate it, making it much more tender and juicy. It's best not to marinate meat too long or it starts to break the meat down turning it mushy. I recommend between 15 minutes and 8 hours. It's best not to handle meat too much while cooking it because it toughens it and squeezes juices out. The rule of the grill is one turn, but on the stovetop it needs more. It first needs to sear on both sides. Then it's best to flip it and turn the heat down so that side doesn't burn, then finish the cooking on the other side. After cooking, baking, or grilling meat it is important to let it rest. The temperature continues to rise, so the meat continues to cook. It also distributes the juices evenly, so fewer are lost during slicing. Heat a large skillet over medium-high heat. Add 1 T olive oil. Add the chicken and cook for a minute or two unitl it starts to brown. Turn the chicken and cook a minute or two until it starts to brown. Turn the heat to low-medium and flip the chicken. Place a lid on the pan and cook 3-4 minutes. Turn the chicken one last time and cook until cooked through 3-4 minutes. 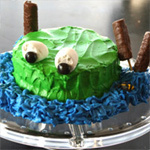 Set aside to let it rest before slicing. 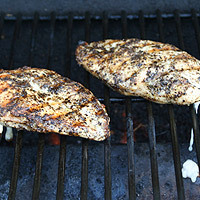 This chicken is great grilled as well. Set the oven to broil. Position oven rack to the middle . 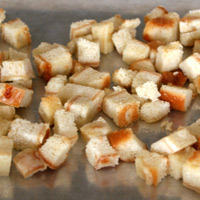 Cube bread and place in a medium bowl. Melt butter and drizzle over bread. Add the salt and stir well. Place on a baking sheet and broil 2 minutes. Turn each cube and broil another 1-2 minutes. Stir well and continue to broil until crisp and lightly browned. Chop and rinse lettuce. 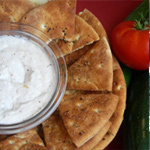 Dry well and place in a salad bowl. Pour dressing onto the lettuce and toss well. 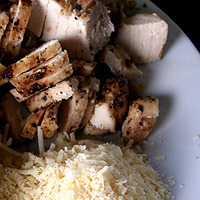 Top with chicken, parmesan, croutons and pasta (if using). Serve immediately. 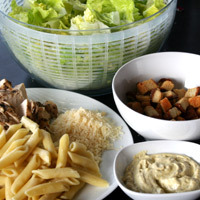 Many Ceasar Salads have raw egg yolks. I like to heat the yolks to a safe point so I can feel comfortable eating, serving and storing this dressing. Be careful not to overheat them or they will take on a eggy taste. Heating them to 160 degrees makes them safe and doesn't give the dressing an eggy taste. Marinate the chicken a minimum of 15 minutes for tenderness and flavor. I prefer to marinate it 2-8 hours in the refrigerator. Don't over-cook the chicken or it will be dry and tough. Just right- Sear the chicken on medium high on both sides, then reduce to low and cover, turning once. High heat- Keeping the heat high throughout the cooking time will dry it out. Low heat- Having the heat too low at the begining won't sear the meat properly. The taste and tenderness will be effected by this. 1. Fill a small pot 2 or so inches with water. Bring to a boil, then reduce to a simmer. 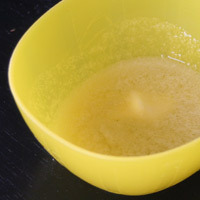 In a glass or stainless steel bowl add egg yolks, lemon juice and water. Whisk well. 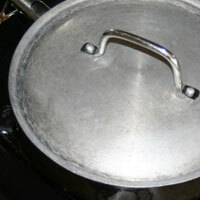 Place bowl on top of pot of (1)simmering water. Make sure the water doesn't touch the bowl. 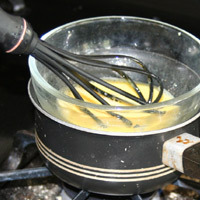 Whisk constantly until the mixture reaches (2)160 degrees. 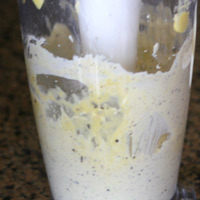 Remove from heat and transfer to a food processor or cup of an immersion blender. 2. Add anchovy or olives, salt, sugar, garlic and parmesan. Blend well. With the mixer running add the olive oil in a slow steady stream. Process until slighlty emulisfied. Stir in black pepper. Tranfer to an airtight container until ready to use. Good in the refrigerator up to one week. 1. 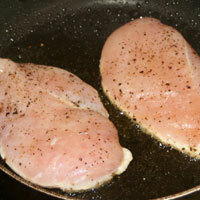 Rinse and pat (3)dry the chicken breasts. In a plastic bag mix the olive oil, salt, and freshly ground pepper. Add the chicken and coat it completely in the mixture. 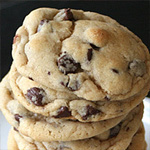 Set aside at least 10 minutes at room temperature or up to (4)eight hours in the refrigerator. 2. Heat a large skillet over medium-high heat. Add 1 T olive oil. Add the chicken and cook for a minute or two unitl it starts to brown. Turn the chicken and cook a minute or two until it starts to brown. Turn the heat to low-medium and flip the chicken. Place a lid on the pan and cook 3-4 minutes. Turn the chicken (5)one last time and cook until cooked through 3-4 minutes. Set aside to let it (6)rest before slicing. This chicken is great grilled as well. Set the oven to broil. Position oven rack to the middle . 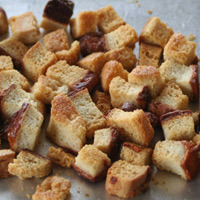 Cube bread and place in a medium bowl. Melt butter and drizzle over bread. Add the salt and stir well. Place on a baking sheet and broil 2 minutes. Turn each cube and broil another 1-2 minutes. Stir well and continue to broil until crisp and lightly browned. (7)Chop and (8)rinse lettuce. 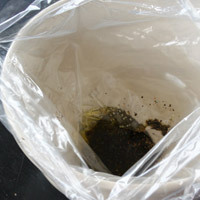 (9)Dry well and place in a salad bowl. Pour dressing onto the lettuce and toss well. 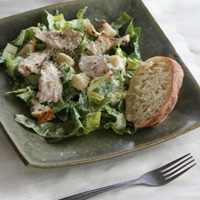 (10)Top with chicken, parmesan, croutons and pasta (if using). Serve immediately. 1. Make sure the water is simmering not boiling. If it boils, it will cook the mixture too quickly and not be smooth or able to thicken properly. 2. Not only is 160 degrees the temperature at which the eggs emulsify, it is also the point at which they are safe to eat. Between 160-170 degrees is the point where the eggs start to stick to the sides and solidify like scrambled eggs. Remove the bowl immediately if this starts to happen and whisk constantly. 3. 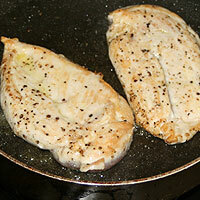 It is important to dry the chicken so the olive oil can penetrate it, making it much more tender and juicy. 4. It's best not to marinate meat too long or it starts to break the meat down turning it mushy. 5. It's best not to handle meat too much while cooking it because it toughens it and squeezes juices out. The rule of the grill is one turn, but on the stovetop it needs more. It first needs to sear on both sides. Then it's best to flip it and turn the heat down so that side doesn't burn, then finish the cooking on the other side. 6. After cooking, baking, or grilling meat it is important to let it rest. The temperature continues to rise, so the meat continues to cook. 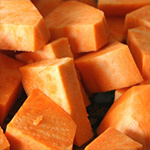 It also distributes the juices evenly, so fewer are lost during slicing. 7. To prevent lettuce from browning on the edges use a lettuce knife. It is a plastic knife costing $3-5. It can be found online or in many kitchen stores. 8. 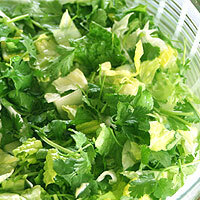 For crisp leaves, immerse lettuce into a bowl of cold water and swish gently to rinse. A direct stream of water on the leaves can bruise them. 9. Lettuce should be gently patted or spun dry. If the lettuce is dried, the dressing will adhere better. Salad spinners work really well for this task. I chop, wash, spin-dry and store my lettuce in the refrigerator in the spinner. It stays crisp and fresh for about a week. 10. I like to dress just the lettuce so it is evenly coated, then add the toppings. 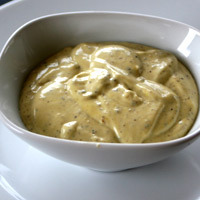 The toppings don't need the dressing and if they are tossed with the salad they often fall to the bottom.